But what seems like a modest goal requires generous resources and public will. St. Coletta has become known in the District for a high quality special education program for students with level four learning disabilities, which includes disabilities ranging from mild mental retardation and severe autism. Students work on a puzzle. Photo courtesy of St. Coletta Public Charter School. The building’s geometric structure designed by the famed American architect Michael Graves, has an operating budget of approximately $14.7 million for its 225 D.C. students (50 additional students come to the school from Maryland and Virginia). “On the first day of the open house, people wept because they thought they’d never see something like this in the District of Columbia,” said Rebecca Hill, the development director at the school. Like other charter schools in the District, St. Coletta enrolls students based on a lottery. All 225 of its spots for D.C. students fill up every year, and most of those students stay in the school. This means there are very few openings for new students every year, a situation that has resulted in a 40-person wait list. What about the students who cannot get into St. Coletta and whose needs cannot be met by the regular D.C. public schools? Some go to Sharpe Health, a regular public school in D.C. The rest go to private schools, at an average cost of $76,000 per pupil, including transportation, according to a November 2007 study on the financing of education from the American Institutes for Research. About 20 percent of special education students in the District go private, which is more expensive than either Sharpe Health or St. Coletta. The stimuli room. Photo courtesy of St. Coletta Public Charter School. Interestingly, the 2007 study discourages creating more special education-specific schools by charter. “A school that is designed specifically for children in special education with very high level and intensive special education programming needs does not fit within the charter concept,” the study said. When St. Coletta, a former private school, became a public charter in 2006, it became cheaper for D.C. to send special education students to there, because it got federal money for special education. St. Coletta’s state-of-the-art facilities, including the Graves building, were funded by its own private fund raising. Each geometric building on the complex is referred to as a house and is organized by developmental stages for the students, whose ages range from 3 to the cut-off of 22. When Paul Stephens and I visited the school last week, we saw at least one therapist assigned to just about every student. In the kitchen–every house has one–a therapist was cutting a banana for a child, to illustrate rules of numbers and counting. This is exactly the sort of attention these students require, according to Hill. The house for the older students was quiet, as most of them were out to work. St. Coletta makes arrangements with area businesses like the DSW shoe store and the cafeteria at the Department of Labor to hire their students so they get work experience. 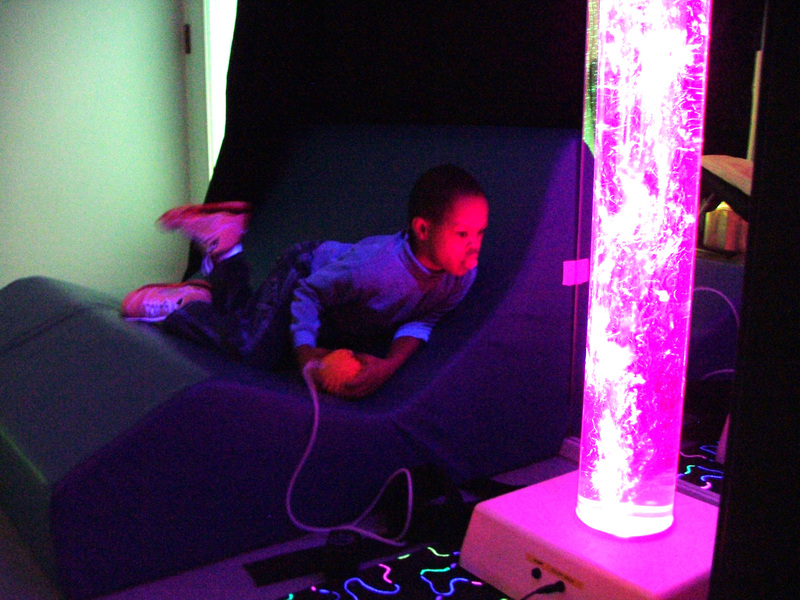 In addition to typical enrichment programs like music and art, the building offers hydrotherapy in a small pool with resistance jets, and stimuli therapy in a room with a bubble pillar that teaches kids to associate the color of a button with the color of the light that emanates from the pillar when the button is pressed. The level of spending per pupil at St. Coletta that goes toward such things as facilities, therapists is necessary, Hill said. A child who learns to feed himself during childhood is less costly and more integrated into society as an adult. It just takes the kind of will that the government has often lacked in funding its public schools. Charter schools that serve students with more moderate special needs are not always prepared to deal with these services. In particular, if a charter school has students who have more minor disabilities than those at St. Coletta, it must first make the effort to provide special education in its own facilities and with its own teachers. This is particularly relevant to D.C., which has a special education population of 17.5 percent, compared to a national average of 13.8. Charter schools served a smaller percentage of special education students relative to their total enrollment than the regular public schools, but this population still grew, to 17 percent, compared to the regular public schools’ 61 percent in 2006, according to the American Institutes for Research study. (Charter school enrollment then represented 25 percent of D.C.’s population, compared with 71 percent in regular public schools. Since then, D.C.’s enrollment has declined while the charters’ have grown). Hill said that providing services for special needs students is something charter schools do not often anticipate. Some charter schools can do this through the D.C. agency that regulates special education law for the D.C. school district, called the Office of the State Superintendent of Education. However, other charter schools take on this burden themselves if they have opted to become their own school district, or “local education association.” This means the school has to respond to special education evaluation requests and have the staff on hand to conduct them. “They’re not getting paid to serve special ed kids, but charter law says that you have to take them,” said Hill. Filed Under: Tapestry of Schools • Washington, D.C.
My English is not good, not too much to see to understand. Congratulations on such a excellent post. I really enjoyed reading it. Thank You! !